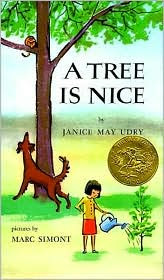 A Tree is Nice comes to mind when I think of summertime books. Charming, old pictures sweetly depict the simple, child-like reasons to like trees. This award-winner makes us want to plant more trees and love trees like Anne (of Green Gables) does.